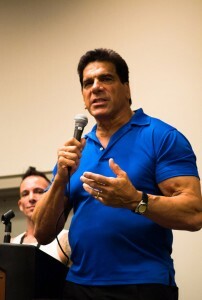 Lou Ferrigno, star of The Incredible Hulk TV series, took questions from the crowd at Salt Lake Comic Con 2013 about his career during his Q&A session. He said that the Hulk’s water scenes were the most difficult as he was coated in grease so that the green paint wouldn’t come off. It would take hours to scrub the grease off. Ferrigno did not know how popular he was while he was shooting the first season of The Incredible Hulk, but he believes that a little bit of the character is in each one of us, and the series is till relevant. “I think the series still holds its own, but you know something? The CGI hulk cannot sign autographs,” says Ferrigno. When the series was picked up by network TV, they changed Bruce Banner’s name to David because Bruce sounded gay. “Bill Bixby (who played David Banner) was a wonderful director, actor, producer,” says Ferrigno. When Bixby died, the saga of the Incredible Hulk on television had ended. The last made for TV move was the Death of the Incredible Hulk. Ferrigno has enjoyed being an icon. He says that the best thing about his role in I Love You, Man was a scene he did with Jason Segel. “The beauty about that film is that I get to put Jason Segel in a sleeper hold,” says Ferrigno. See Ferrigno talk about getting Stan Lee to Salt Lake Comic Con 2013. See Ferrigno talk about auditioning for the Hulk. See Ferrigno talk about meeting Mr. Rogers. See Ferrigno talk about being hearing impaired.